Highlights from the second round of the WGC-HSBC Champions in Shanghai. 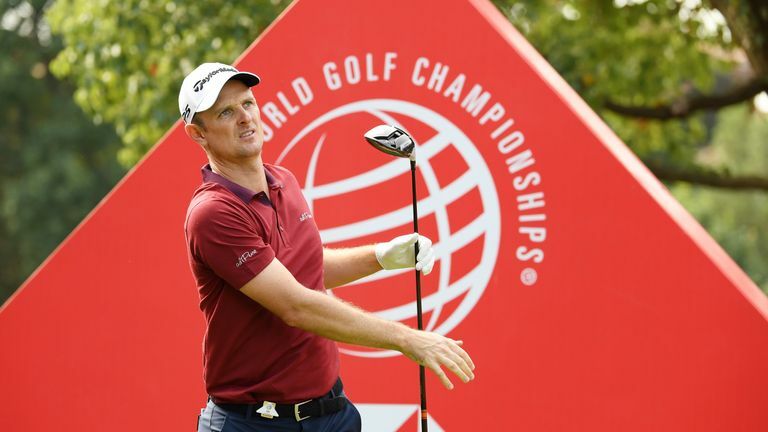 Justin Rose remains in contention to successfully defend his WGC-HSBC Champions title after moving within three strokes of halfway leader Tony Finau in Shanghai. Rose, who overturned an eight-shot deficit on the final day to win in 2017, followed up his opening-round 69 with a bogey-free 67 to get to eight under at Sheshan International Golf Club. The Englishman is joined in a share of second by overnight leader Patrick Reed and playing partner Tommy Fleetwood, as Finau carded a five-under 67 to pull clear at the top of the leaderboard. "I played really nicely and I'm happy with the way I finished after making a few big numbers in the middle of my round," Finau said. "I have to stay aggressive and make birdies because I know the guys are going to do that on the weekend." Starting the day two off the pace, Finau birdied the par-five second and holed a 15-footer at the fourth before posting back-to-back gains from the seventh to reach the turn tied for the lead. Reed made back-to-back gains from the second but lost his lead with successive bogeys from the fifth, as Finau converted from 10 feet at the 10th to open up a three-shot cushion. Finau double-bogeyed the par-four 11th after getting an unfortunate bounce off a sprinkler head and failed to get up-an-down from a bunker to save par at the 13th, only to birdie three of his last five holes and set the clubhouse target. Reed bogeyed the par-five 14th but struck his approach at the 16th to within tap-in range, before recovering from finding water off the 18th tee to fire a hybrid over the hazard and salvage a par. Rose reached the turn in 33 and followed a birdie at the 11th with a two-putt gain in the last, where Fleetwood also made birdie to join his Ryder Cup team-mate three off the pace. Xander Schauffele holds fifth spot on seven under ahead of Patrick Cantlay, while Thomas Pieters moved inside the top-10 after a round-of-the-day 64. Four of the five highest-ranked players in the field ended the day over par, with world No 1 Brooks Koepka struggling to a two-over 74 and Rory McIlroy carding a triple-bogey and a double-bogey on his way to a five-over 77. Watch the WGC-HSBC Champions throughout the weekend live on Sky Sports. Live coverage continues on Saturday from 4am on Sky Sports Golf and Sky Sports Main Event.